I've said it once and I'll say it again - I love Guinness. No, no, not the drink. Nasty, vile stuff. I'm a wheat beer kind of a girl. I mean the Guinness Book of World Records. Who knew that Wo Zuyou could blow up a 6.33 inch diameter balloon with his eye in one minute? Or that 1,470 is the most people who have ever flossed simultaneously on the same continuous piece of floss? Growing up, I can't count how many times I checked the Guinness Book of World Records out form the library. It was fun seeing and reading about the tallest, longest, smallest, fastest, heaviest things and people in the world. Makes you really believe anything is possible. I considered going for the longest fingernails record myself, but being the compulsive nail nibbler that I am, it just wasn't in the cards for me. I thought it was very cool that the nails started to spiral though, like some deep sea creature. While I can't grow nails that exceed a quarter inch to this day, I CAN be part of a Guinness record this Saturday, and maybe so can you! April 23rd at 11am parents all over the world will be going for a new world record - most cloth diapers changed simultaneously. And Ivy and I and our trusty diaper bag will be right there in the thick of it. And if you've got a baby you can scrounge up from somewhere, you can join us too! There are five locations participating in the event on Saturday - Health Foundations, Bamboo Baby, Comfy Cozy, and Peapods will all be hosting official diaper changing events but I'll be attending the event put on by All Things Diapers. You can find out which event (worldwide) is nearest to you at the Great Cloth Diaper Change website. Some of the events will even be having free food and prizes. Nothing I like better than free food and prizes. But if you don't have a baby, you can still have fun and win prizes today - RIGHT HERE! Norwex Enviro Products radically reduce the chemical use in your personal care and cleaning and I'm all about getting rid of as many chemicals in my house as I can, how about you? This cloth lets you clean your window and mirrors with just water and still have them sparkle. 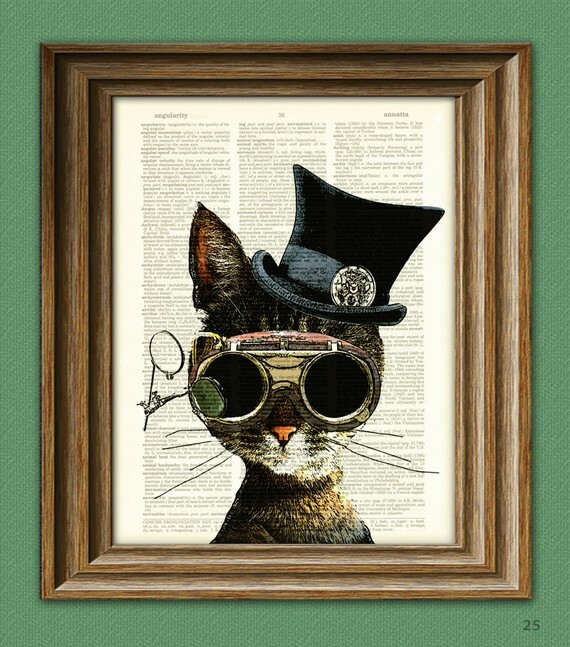 This is an upcycled art print by collageOrama featuring a kickin' kitty printed on an old dictionary page. This is for the print shown but the frame is not the one pictured, but a similar one found at a local thrift store. It's a crayon roll for grown-ups (or kids, but I bought one for myself and I'm not sharing) by quiltedmemories4U. 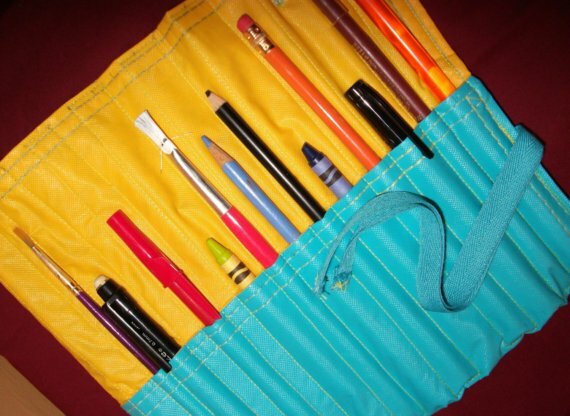 It is extra tall so it's perfect for organizing your knitting needles, paintbrushes, pencils, or thin markers. And last but not least, an adorable bib made from fused plastic bags by mandolyn. 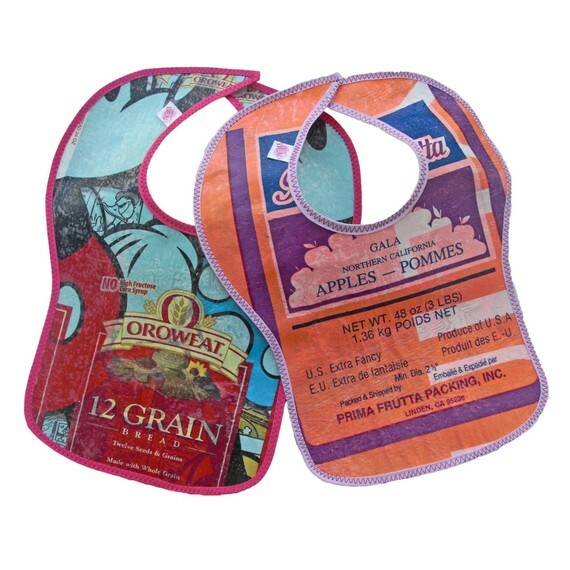 You get your choice of the red bound or purple bound bib. Whew! How fun is that? Fun. Go on a litter walk! Or do some other Earth Day activity. This will earn you five entries if you tell me about it in the comments (or even better, link to your blog post telling everyone about what you did). You can get five more entries if you want to take some pictures and send them to me to include in a future blog post. Easy enough huh? Entries for the giveaway will be accepted until midnight on April 29th, so start entering and Happy Earth Day everyone! -I want that kickin' kitty picture! -We recycle and use CF bulbs. How cool! I loved the Guiness Book growing up and remember that guy from India with the spiralling fingernails! ;) Today, my kids love it just as much as I did.